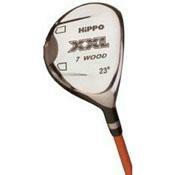 The new Hippo XXL Fairway Woods share the same advanced technology. Manufactured from 17-4 stainless steel, the XXL Fairway Woods feature a maraging steel face and the unique energy cell system designed exclusively for Hippo Golf. A deep face design and power channel soleplate creates excellent impact efficiency for penetrating, powerful shots from the fairway or tee. For a "budget" product this delivers. I visited my bro in law out of state & had to play w/ a mishmash of clubs. I couldn't hit his driver for beans so went to work on the 3 wood. The clean shots were long & beautiful off the tee. I couldn't hit it off the grass but don't like any 3 wood off turf. It's kinda heavy. It's a low profile wood & very penetrating ball flight. Mis hits for me resulted in pulls & hooks. Line it up dead in the center of your stance & you will be on it.